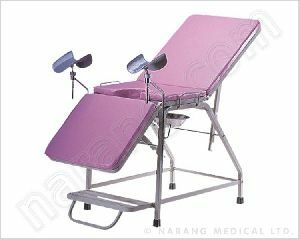 Delivery Table / Bed, made in 3 sections. 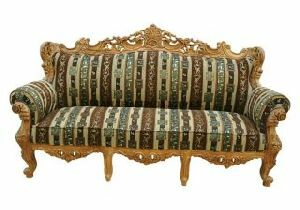 Size: 1680 × 620 × 800 mm. 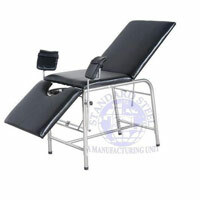 With adjustable Back rest & leg rest to varying positions. 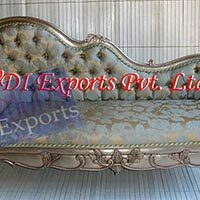 Framework made of Mild Steel Epoxy coated finish. 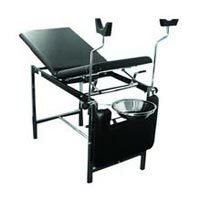 Supplied with S.S. bowl and two leg holders. Mounted on protective stumps. Freight saving knock-down construction. 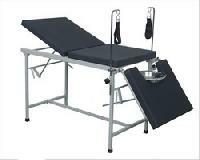 Top made in 2 section, fabricated mainly out of 1.22mm (18 SWG) thick MS or SS sheet, welded to the horizontal supports, which it makes rigid & sturdy hospital Furniture. 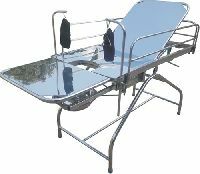 MS Material Pre-treated In seven Tanks chemical process & epoxy Powder Coated, which it makes uncorrosive Medical Equipment Medical Furniture.